Create an ever green look in your backyard with the Aspects Large Spruce Quick-Clean Seed Tube Wild Bird Feeder. The dark green accents and timeless design will certainly make this a welcome addition to your bird garden. 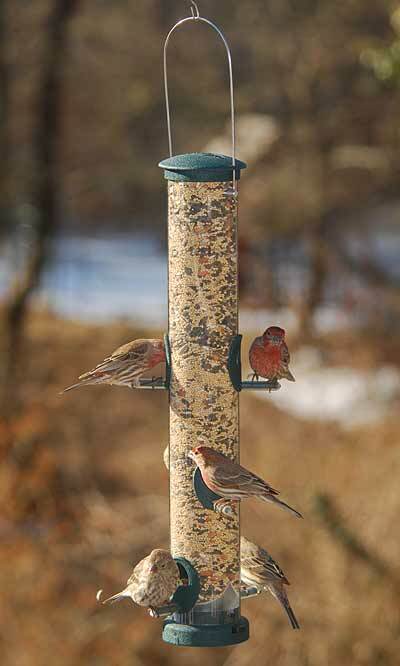 Its UV stabilized, polycarbonate seed tube easily holds 1.3 quarts of sunflower kernels, cracked corn, or mixed seed, and the six ports invite your feathered friends to dine. Each port is reinforced with green metal, and the six perches each have a plastic cover to ensure the birds are comfortable while dining. The clear tube keeps seed levels visible, and the metal cap and base complete the unit. A seed diverter at the bottom of the reservoir ensures the item empties completely, and the innovative, Quick-Clean base removes easily by squeezing its two plastic tabs, for you to fully clean the piece. The robust metal cap slides up the attached hanger for refilling, and the hunter green hue offers a natural hint. Suspend the unit from a hook with its top hanger, or pole mount it using the threaded port on its base. This feeder's polycarbonate and metal body withstands the rigors of use outdoors for many seasons. Faithfully offer birds their favorite seed using this Large Spruce Quick-Clean Seed Tube Wild Bird Feeder. Made in the USA. Lifetime guarantee.